Jameel Warney has returned for year three with the Texas Legends, but don’t call him a veteran. The 24-year-old New Jersey native comes off a season most could only dream of. He starred for Team USA in the 2017 AmeriCup, helping lead the Stars and Stripes to a gold medal, earning a spot on the all-tournament team and tournament MVP honors. Warney was also named 2017 Team USA Male Athlete of the Year, but his accolades didn’t stop there. In March, the Dallas Mavericks signed him to a 10-day contract and in his three NBA games, the big fella earned solid reviews from Mavs head coach Rick Carlisle and his staff. 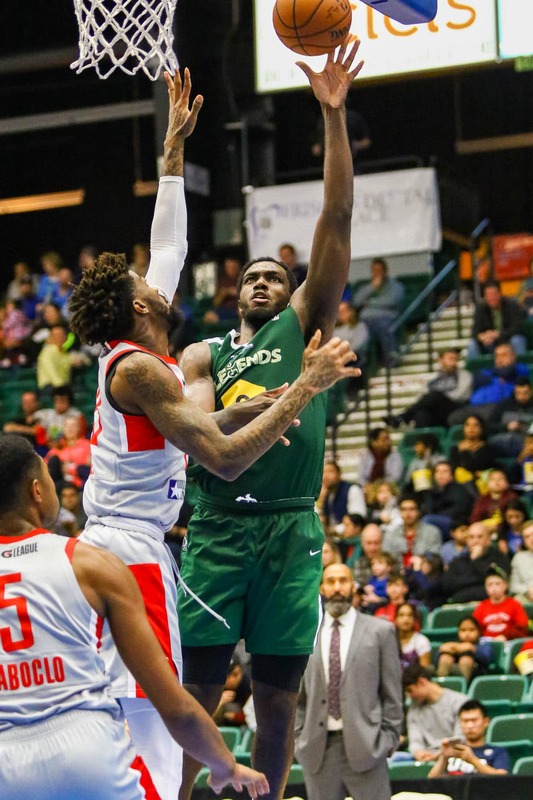 Warney then returned to the Legends, helped them reach the playoffs for just the second time since a move to Frisco and was named first-team All-G League. So, given all that he’s accomplished on the hardwood over the past year-plus, he had a nice relaxing summer heading into this season, right? That’s because Warney spent part of his offseason in China playing for the Anhui Dragons of the NBL, at least until injuries caught up with him. Warney said he tweaked his knee in China, but even with his readiness in doubt heading into the Legends’ November 9 season opener, he has already appeared in nine games for Texas and averaged 17.7 points, seven rebounds, 2.7 assists and 2.1 steals per game. In short, those are the kinds of numbers from a player with ample G-League experience and some NBA experience that turn the heads of NBA brass. And if Warney’s strong performances, which includes three double-doubles in the Legends’ first nine games, there is a very good bet that he will be getting a serious look to be signed to a 10-day contract come January. Third-year Legends head coach Bob MacKinnon Jr. is happy to have his affable big man in the mix yet again, and the veteran bench boss knows Warney might not be a Legend for long this season as it’s clear he could earn a return trip to the NBA in the near future, whether it’s with Dallas or another team. “He’s a guy that coming back now for his third season (who) I fully expect to be on the NBA radar and someone that hopefully, people are going to look at seriously and to be quite honest, he should not be in a Legends uniform for very long if people (in the NBA) are really serious about winning,” MacKinnon Jr. said. Getting the opportunity to play for MacKinnon Jr. again is one big reason Warney wanted to return to the Legends for a third consecutive campaign. “I had a lot of offers overseas, but I felt like with Bob and just helping you get better with the coaching staff, the organization being behind you every step of the way, it was kind of a no-brainer to come back and try to get to where I need to be at and just try to make it work,” he said. But, now that Jameel Warney got a small taste of what life in the NBA is like, his focus is squarely on not just returning, but on how to stick there permanently.